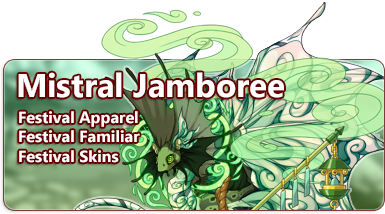 This month, all of dragonkind come together to participate in the Mistral Jamboree. This festival celebrates the wind flight. Our most prized possession, Messengers Scrolls, can be found by using any gathering profession in the wind territories this week. Neutral and wind-aligned monsters also have a chance to rarely yield these items as drops in the Coliseum. They may be crafted at Baldwin's Bubbling Brew using alchemy reagents. A tightly-bound message, possibly meant for someone special. This can be traded at the Festive Favors shop during the Mistral Jamboree. The Festive Favors holiday stall is now open for the duration of the holiday and you may trade in Messengers Scrolls for exclusive items. It will remain open until the holiday comes to a close on Sunday, March 31 at 06:00 server time. The constant windswept rustle of bushes, grasses, and trees are enough cover for clever acts of thievery. Watch your hoard closely on blustery nights. For the remaining duration of holiday, 12 of these skins will be stocking in the Treasure Marketplace and six of them will very rarely gathered by digging in wind territories or by battling in the Coliseum. 2 of these skins will be exclusive to Baldwin's Bubbling Brew. Mistral Jamboree 2018. (1/14) Designed by Autopilot. Mistral Jamboree 2019. (2/14) Designed by Mysh. Mistral Jamboree 2019. (3/14) Designed by Saerino. Mistral Jamboree 2019. (4/14) Designed by RubieKanary. Mistral Jamboree 2019. (5/14) Designed by constellationxx. Mistral Jamboree 2019. (6/14) Designed by Electropunk. Mistral Jamboree 2019. (7/14) Designed by Minnowbutt. Mistral Jamboree 2019. (8/14) Designed by Quintillion. Mistral Jamboree 2019. (9/14) Designed by TinyGryphon. Mistral Jamboree 2019. (10/14) Designed by bioluminosity. Mistral Jamboree 2019. (11/14) Designed by Bluwiikoon. Mistral Jamboree 2019. (12/14) Designed by Kamazu. Mistral Jamboree 2019. (13/14) Designed by Catfeather. Mistral Jamboree 2019. (14/14) Designed by Desnik. I hope you all have an awesome Mistral Jamboree!! [emoji=gust]Happy Mistral Jamboree[emoji=gust] Edit: Finally I could! Yeah! First page! Yahoo! Edit: Finally I could! Yeah! First page! Yahoo!